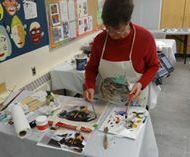 A space and time to view and to respond to my watercolour, acrylic, and multi media paintings. There is something about trees. They are a way to escape the urban environment. After a hiatus I am happy to be blogging again! I am also back to painting and finished what I believe is the last cow in the herd. I am feeling "cowed". He is sharing some "news" on his forhead but you may have to purchase him to read it. I seem to be on a roll, having never painted animals before. Recently I was given an opportunity to leave my recent obsession with the bovine family and contribute to a dog rescue group by painting a member of the canine family. Some members of the North York Visual Artists group were asked to paint pictures of rescued dogs onto canvas tote bags. 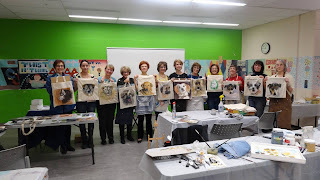 This was under the direction of one of our members, a talented painter of animals - Soudabeh Majidi. The bags would later be offered for sale to support a volunteer rescue group. Founded in 2004, the Vafa Animal Shelter is the first animal shelter in Iran. We are dedicated to providing help and shelter to injured and homeless animals in Iran. The Vafa shelter is a non-government charity organization relying solely on private donations and volunteers. Hundreds of stray dogs live in the area. Since they are not altered, they constantly reproduce. Cars often hit dogs as they cross busy highways. Not all die immediately. Some linger in agonizing pain on the roadside for days until they finally perish. We are located in the town of Hashtgerd, about an hour and a half west of Tehran on the road to Ghazvin. Hope lived with her puppies. Some of the puppies were shot by contractors and Hope was also. She survived, but surgery is not possible and she retains some bullets. She managed to return to the site to protect her puppies. Hope has been adopted by a family in the USA. Darcy is our dog. He was a stray and rescued by "Speaking of Dogs" a rescue group. Oh no! How did he get here? I thought he was sold. He must think he is a cow. Thanks for hanging around the paddock. Hang on to your artistic sense of humour! In the last post I explained my admiration of everything bovine: they remind me of some people I know - but no - I love their soft eyes, their varied colours, their placid nature, their international habitats and their soft "moos". Their babies are charming. They are also just amusing, and a great diversion from "serious" art. The herd will meander through these posts for the next week. Watch out for cow patties!! Don't you just hate blocks of any kind? I especially hate artist's block. What this means is that just when the New Year is a fresh start and calls for inspiration - I am stuck! 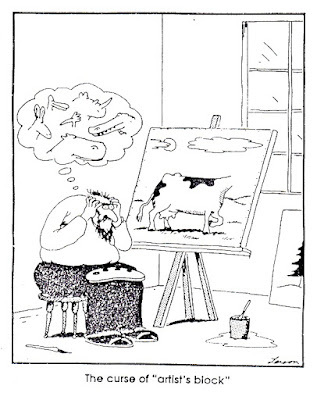 Gary Larson, was a very prolific creative genius who before his retirement produced 23 books of collected cartoons, with combined sales of more than 45 million copies. When I saw this cartoon it spoke directly to me in more ways than one. 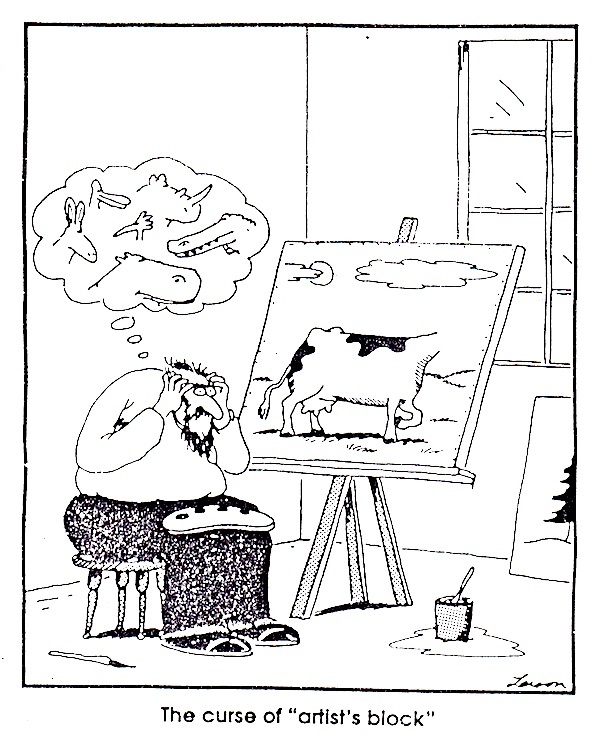 First of all, I have to get on with producing my collected works of art, and secondly, it reminded me of my desire at one point to paint cows. "Why paint cows?" you say. Perhaps because they remind me of some people I know - but no - I love their soft eyes, their varied colours, their placid nature, their international habitats and their soft "moos". Their babies are also charming. I have in fact a herd of photographs of cows doing various things in various parts of the world. Talk about inspiration! I no longer feel "cowed."